"The Organ Historical Society Emblem Organ"
The brick church was built in 1822, Alexander Parris of Boston was the architect, and the box pews remain in use. Long the "logo" organ of the Organ Historical Society, a drawing of the mahogany veneer case has become familiar world-wide. It is the product of Lemuel Hedge (1786-1853), an inventor, prominent Mason, parishioner and Vestryman of St. Paul's Church. 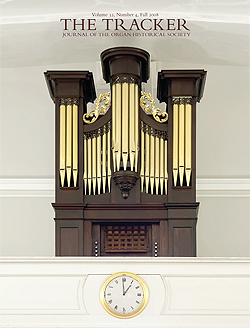 The organ could date from 1825, and there are references to an instrument in St. Paul's Church in 1824. Mr. Hedge was perhaps assisted by William M. Pease, a music teacher, organist, and piano and organ tuner from London England. The Hedge organ, likely of no more than five stops, with a G-compass keyboard and no pedals, apparently had maintenance problems. An 1834 receipt reveals that Henry Pratt, the pioneer Winchester, New Hampshire builder, was paid $112.50 for repairs, he and his son spending five weeks in Windsor, their board costing an additional $20.00. In 1851, William Nutting, Jr., of Randolph, Vermont (and later Bellows Falls), who tuned the organ for many years, was paid $158.12 for repairs and there is mention of pipes for "the Swell". In 1868 the organ was moved from the gallery to a chamber opened up at the right of the chancel, and Mr. Hamill was instructed to build a new organ "...to be fitted to the old front, which we are desirous of retaining so far as practicable." The work cost the parish $747.49. In addition to keeping the recessed keydesk's doors, Mr. Hamill may have retained the manual keys and a few pipes, but he certainly recycled other old pipes, as well as installing a 56 note chest. The Hedge case was rather plainly extended to the rear, but the Bourdon pipes, on a separate chest at the back of the case, were left projecting beyond the paneled sides. In 1974, the organ was placed in storage while the building underwent considerable renovations, and in 1979, it was returned to the gallery. A new supply house bellows and electric blower were installed at that time. In August of 2006, the church began additional restoration work again requiring removal of the organ. A comprehensive restoration of the organ was included. 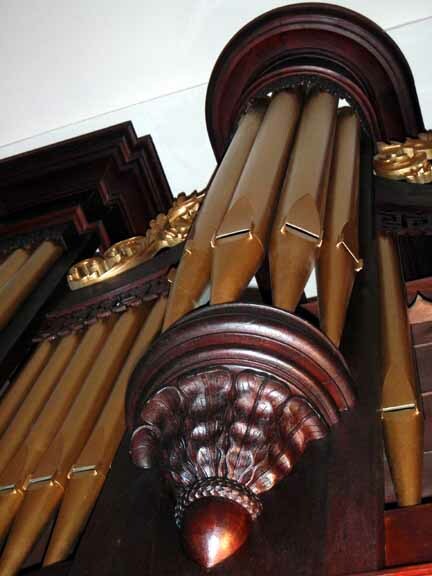 2) Repair the pipework, including replacing many "fill-in" pipes which had been added to the organ and restore the voicing so that the instrument could effectively lead singing. 3) Complete a thorough mechanical restoration of the organ. 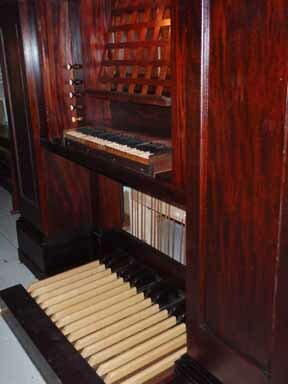 4) Repair the wind system of the organ by building a new bellows in a size and form suitable to the instrument. 5) Raise the organ by three inches and move the pedal keyboard farther into the case so that the organist was more comfortable while playing. 6) Relocate the pipes of the pedal Bourdon so that they are not visually distracting. 7) The organ case was to be cleaned and minimally repaired in a historically sensitive manner. Restoration work on the organ began at the Russell shop in the spring of 2008 with reinstallation occurring during August. Dr. Carol Britt presented the organ in its first public performance as part of the "Vermont and New Hampshire Organ Tour" on August 28, 2008.